Thomas was the son of Thomas and Margaret Bulch, one of thirteen children. The family lived initially at Strand Street, New Shildon (of which only the New Mason’s and a short row of houses remain) before moving to Adelaide Street. Thomas’s father, having narrowly escaped death in a rail crash while working as a locomotive fireman, became a timekeeper at the N.E.R. New Shildon Railway Wagon Works. After schooling at the British School on Station Street, Thomas became an apprentice Blacksmith at the same works by 1881, and by 1884 appears to have progressed to the position of Fitter there. Thomas’s father and uncles were bandsmen in local bands, and his maternal grandfather Francis Dinsdale was the bandmaster of the New Shildon Saxhorn Band. Naturally, it was not long before Thomas started to learn music himself. He started playing the piano, being mostly self taught, then with the help of his father moved on to brass instruments. He showed a great aptitude for music in his early years and it was at the age of 12 that he joined the New Shildon Juvenile Band formed by his uncle Mr. Edward Dinsdale. The Dinsdales lived close to the Bulch Family, only a few doors away. Thomas started to compose music and at the age of 17 composed his first contest march, “The Typhoon”. At the age of 19 he took over from his uncle, as bandmaster of the Juvenile Band, but then rather than take over from his grandfather’s role of bandmaster of the New Shildon Saxhorn Band he became involved in the Temperance movement and was one of the first members of the breakaway New Shildon Temperance Band. In 1884, at the age of 21, Thomas migrated to Australia on the ship “Gulf of Venice“. Some former New Shildon residents, the Malthouse family who had emigrated earlier, suggested he go there, as he would have good prospects in music. It was further said among family that he left for Australia for health reasons. In any case he did not travel alone. With him were two fellow bandsmen from the New Shildon Temperance Band, Sam Lewins and James Scarffe. The three would entertain passengers on the long voyage by practicing their music. Thomas arrived safely at Port Adelaide, despite the “Gulf of Venice” lost two propeller blades in the heavy seas, slowing its pace from 12-13 knots to just 9. By making the voyage, Thomas was following in the footsteps of a great uncle who had perished not long after his own ship had crashed ashore about ten miles south of the port. He was met by his friend and fellow bandsman John Malthouse. Shortly after his arrival in Creswick,Thomas was asked to take control of the 3rd Battalion Band, and the Allendale and Kingston Brass Band. 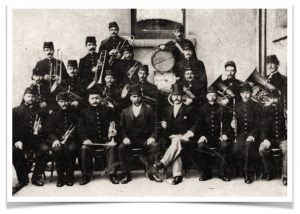 It was with this band that he entered his first Australian brass band contest in 1886 at the “Creswick Miners Sports”, band took first place. Thomas was married not long after arriving in Australia to Eliza Ann Paterson, the daughter of the mine manager of the gold mine at Creswick, Old friend John Malthouse was his best man. In 1885, after some fundraising, in part by the New Shildon Temperance Band back at home, Thomas was joined by his older brother Francis. With Francis’s experience as a miner back in New Shildon, he was able to secure a job at the gold mine. However this was not to end well. In July 1886, as a result of a tragic accident, Francis Bulch was killed along with another miner at the gold mine. Thomas had to arrange the funeral for his brother. Thomas and Elizabeth also lost their first infant child in this year, and back home in New Shildon Thomas’s mother Margaret passed away. His father quickly remarried to a Margaret Harrison also of Adelaide Street, and acted as an agent for Thomas selling his music compositions to brass bands back in Britain. Following a dispute with the Commanding Officer in 1886/7 in part over the facilities available to the band, Thomas resigned as bandmaster of the 3rd Battalion Band. He then formed “Bulch’s Model Band”, a private band. Some of the bandsmen also resigned from the 3rd Battalion Band and joined him as members of the “Model Band”. Bulch’s Model Brass Band benefited from strong public support and a well organised committee. With enthusiastic fundraising they were quickly well equipped, well turned out and established a fine reputation for their abilities. Though Thomas initially took a regular job in Australia, in addition to his bandmaster duties, he fully intended to realise his ambitions to make a living from music one way or another. He set up a partnership with John Malthouse to acquire and open a music shop on Sturt Street in Ballarat. From here, in addition to selling musical instruments, Thomas was also able to publish his own music and start a brass band journal rather like those that had begun to spring up back in Britain. Thomas founded the Australian Brass and Military Band Journal. In March 1889 however a devastating fire engulfed the music shop and it was totally destroyed along with neighbouring premises. This was the beginning of a difficult period for him financially, though he attempted to bolster his earnings by hiring out his services as a highly respected brass contest judge – not only on the Australian mainland but also New Zealand and Tasmania. Eventually though he accepted an offer from Suttons of Melbourne to relocate to that city and work for them. There was much regret in Ballarat at his departure. In Melbourne, Thomas also became bandmaster of the GPO Military Band there, and moved to working for Allan and Co, a music publishers where as well as contributing his own work, he spent much time editing the compositions of others. Allan and Co. experienced a downturn in fortunes in the mid 1890s. By the late 1890s Thomas and Elizabeth had a family of five children, Adeline, Thomas Edward junior, Myrtle May, Alice Bertha and John Southey Paterson. BY 1897 things had worsened financially to the point that, despite his reputation, and being so prolific in his composition that he felt he had to use several pseudonyms as buyers saw his name on new pieces so often, Thomas had to declare himself insolvent. He had no intention of giving up, though. Back in Ballarat his former band, Bulch’s Model Brass Band, which had continued under his name, and with some ongoing influence from him, under several other band masters, eventually became the City of Ballarat Brass Band. Thomas became the bandmaster of the Soldier’s Hill Brass Band which he retained until 1905 and other’s at the same time such as the Ballarat Railway Band. He continued to attend reunions of the 3rd Battalion Band and was still treated with reverence for his earlier influence. Thomas would create pieces for friends, or for specific brass bands to perform at contest. For example the piece Bathhurst was for his friend and former travelling companion Sam Lewins who had become the bandmaster of the Bathurst Brass Band where he would remain for over fifty years. In 1904 he created a naval fantasia entitled “The Bombardment of Port Arthur” describing through music a famous Japanese naval victory over the Russians. He was honoured by the Japanese who adopted it as one of their principal pieces of army music. Apart from his need for income to support his family he had a great love for composing and spent much of his time at the piano working on his music. He wrote under many pseudonyms and it is difficult now to identify all his work. Some of the better known names he used are Godfrey Parker, Henri Laski, Pat Cooney and Eugene Lecosta. These are but a few of the names used. He wrote and dedicated compositions to all the female members of his family. These were: For his wife he dedicated the music and song “My Darling Wife” and a waltz entitled “My Polly”. It was thought for some time that Carl Volti was another Bulch pseudonym but this was in fact a pseudonym of a well known Glaswegian composer and conductor Archibald Milligan. His eldest daughter Adeline had the compositions titled “Little Dark Eyes” and “Adelina” written for her. His daughter, Myrtle May had a waltz “Les Fleurs D’Australie” (Flowers of Australia) dedicated to her. Thomas loved wordplay and would use it in choosing his pseudonyms and in the titles of musical pieces that were personal to the family. The names of Myrtle and Adeline were combined to name a waltz “Myrine”. His youngest daughter Alice had her name combined with that of her husband Norman (Johnson) to title a waltz “Noralla” and a mazurka using her name as the title, “Alice Bertha”. The composition “Craigielee” composed by Thomas using the name Godfrey Parker is understood to have a connection with the music of “Waltzing Matilda”. It has been written that a Christina MacPherson heard it being played at the Warmambool Races in 1894. She later played it from memory in Queensland and Banjo Paterson put words to it. Christina MacPherson later wrote acknowledging this influence. Of course “Waltzing Matilda” went on to be considered an unofficial anthem representative of Australia. In the early 1900s he tried to establish another brass band at Sale, before switching his attentions to the Albury Town Band. In 1911 he was also appointed bandmaster of the West Geelong Brass Band. In Geelong he would also play piano in the movie theatre, enjoying the opportunity to improvise pieces to accompany the silent moving pictures, a skill in itself. He then moved back to Melbourne where he established another music store and publishing house. In 1906 Thomas’s father, Thomas senior, passed away at his home in Adelaide Street, New Shildon, having just shortly before rewritten his will to disinherit Thomas and his brothers and sisters in favour of his new wife and her two existing daughters. heritage. The greatest tragedy however was that his son, Thomas Edward Buch junior, enlisted in the Australian army, and was killed in France on the 20th June 1916. His younger brother also enlisted but made it back alive. After the war, in 1920, Thomas took a job with Palings of Sydney as an arranger and transposer of music, but also continued to be a prolific composer in his own right. He also taught piano, cornet and violin from his home, then in Mascot, Sydney. His health declined in later life and, though he kept up his music to his very last days, he passed away, at home, on 13th November 1930.